Michael McFadyen's Scuba Diving - Jans Tunnel (Lost World), Poor Knights, NZ The western side of the Poor Knights Islands are the most protected from seas and winds and are consequently the most dived location. 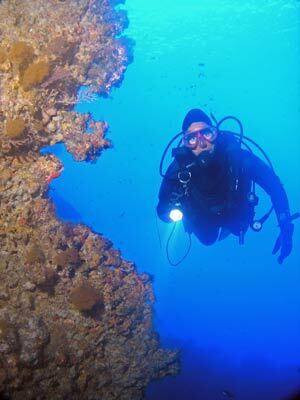 All along the approximately 5.5 kilometres section of the two main islands there are dive sites. 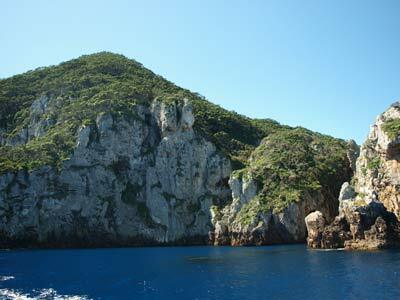 I estimate that you could do two dives a day for over a month along this side of the islands and not repeat a site. 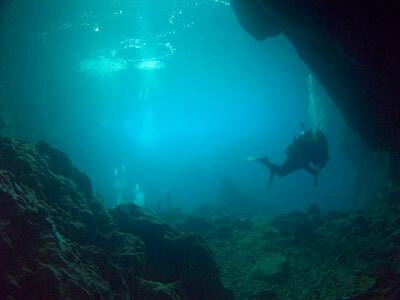 At almost the southern most point of the southern island of Aorangi Island, there is a brilliant dive site called Jans Tunnel. 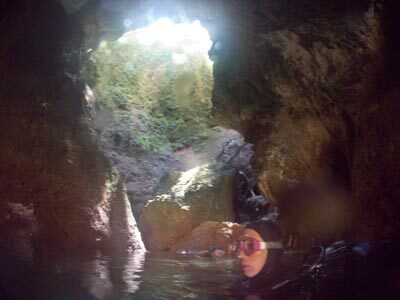 This site was named after the wife of the famous New Zealand diver, Wade Doak. Just to the north of the southern point there is a small point that juts out perhaps 30 metres or so. This creates a small bay on the northern side of the point. A GPS reading of S35º 29' 14.9" E174º 44' 08.7" (using WGS84 as a datum) will put you in the small bay. Jans Tunnel is at the head of the bay, but the point is also a great spot to explore. Once you descend, head south over to the wall and then west out towards the point. 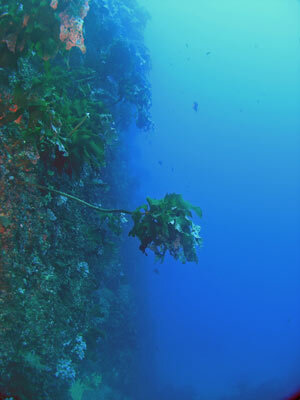 There is a small bombora off the point and this makes an interesting part of the dive. The wall here is quite vertical and relatively clear of kelp. 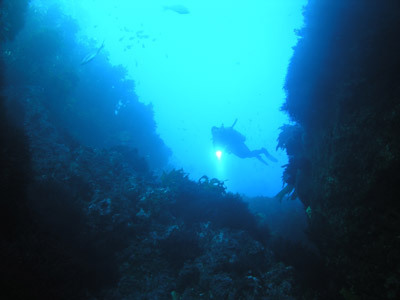 You will need to drop to at least 20 metres to get the best out of the dive. Soon the wall turns to the south. 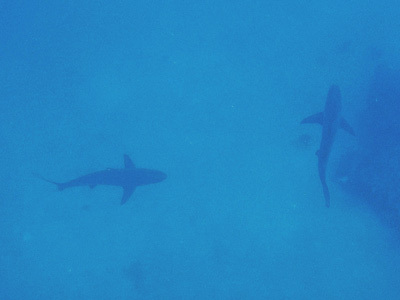 In this area keep an eye out for sharks, we saw two large bronze whaler sharks below us as we swam along the wall. There were also quite a few medium sized bullrays around here as well. Soon you will see that you have rounded the bommie. A good route is to now go up shallower and over the gap between the point and the bommie. You will come up from 20 metres to about 7 or 8 metres before dropping down again to 15 metres. Now backtrack to the east. After a while you will come across some larger boulders. Go up and over them (depth about 6.5 metres) and then ahead you will see the entrance to Jans Tunnel. The really interesting thing about this tunnel is that it ends in two large caverns, both of which are open to the air and jungle of the island. 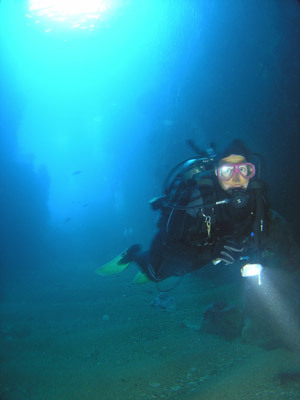 There is at least one similar dive site in the Solomon Islands where you can do this (Munda I think) and The Cathedral in Port Vila, Vanuatu, where you can see the sun and sky above but not really see much else. The "alley" leading to the tunnel is quite long, perhaps 20 metres or more and is about 8 metres deep. It has a sandy bottom and is very obvious once you come over the boulders. Soon you will see the tunnel itself angling a little off to the left. The tunnel is about 25 metres long and quite dark, so a torch is handy (as it is on all Poor Knights dives). The depth in the tunnel is about 6 metres and comes up to 3 metres at the end. Once you have reached the end of the tunnel you will see a large cavern, open to the sky. This is part of what is called The Lost World. The Lost World consists of two large caverns open to the air. There is another tunnel that leads off to the left of the main cavern. 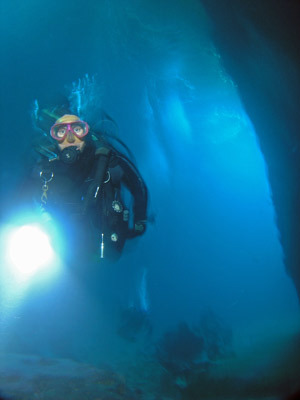 About 15 metres long you come to a smaller cavern that is also open to the sky. 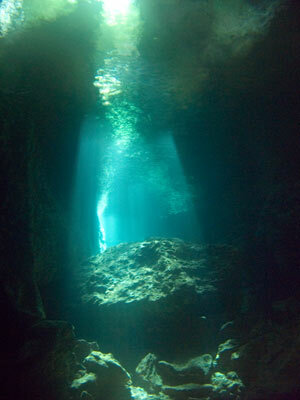 If you dive at the right time of the day the sun streams in from above here. This is also the better one for this as it is smaller and the sunlight more concentrated. It is also the better one to surface in. You can stand up here and look around (see the photograph below). You can see the jungle out of the hole and the walls about 10 metres high. We spent three or four minutes on the surface here chatting and taking photographs before descending and heading back out the tunnel to the main cavern and then out through Jans Tunnel to the outside. It will be 30 minutes or so into the dive by now. Once outside, follow the wall to the north. There is a ridge underwater that runs out north-west. You can follow this for five minutes before turning north-east and heading back to the wall. Turn right head back along the wall towards the boat. As you go, ascend to five metres and do you safety stop on the wall. From here you can easily swim at five metres to the boat. In this area there were a lot of large kingfish and snapper. This is a very good dive, with quite an (almost) unique experience of surfacing from the ocean inside an island. Visibility was 30 metres and the water temperature 21° in March.